THIS radical-looking prefabricated house is one of the many types which have’ been submitted to the Division of Defense Housing Coordination as a quick, cheap method of housing defense workers. The house weighs only a ton, and can be constructed in six days by one man. 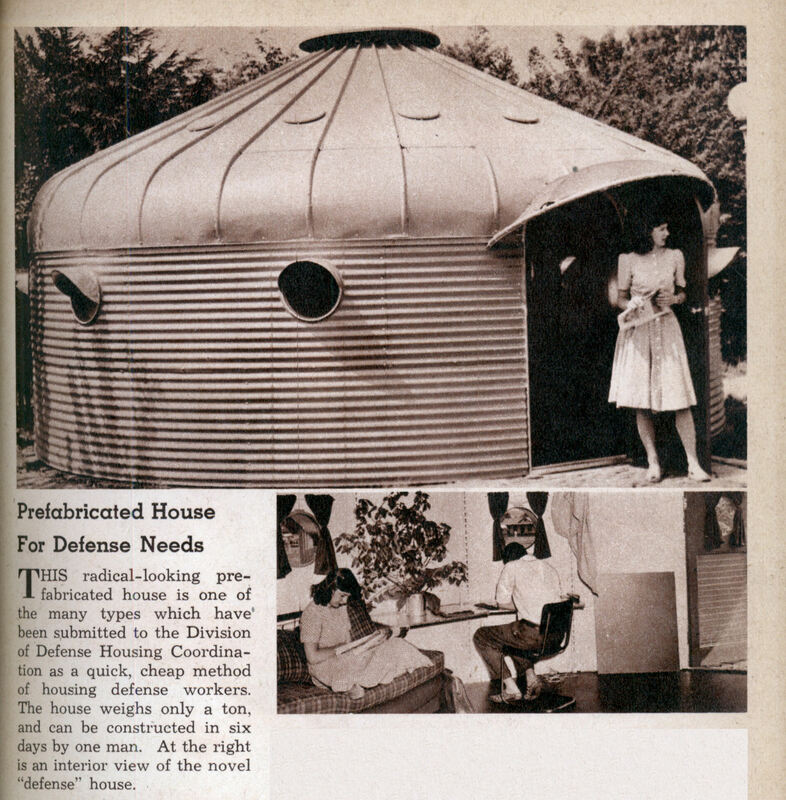 At the right is an interior view of the novel “defense” house. That’s a grain silo! Nothing more. Every other farm has one or several. Hah, maybe FEMA should take a look at these. They can be erected in only 6 days, whereas a FEMA trailer takes over 9 days. That’s about 350 “square” feet and with a door or window every 8 feet or so. Where do you sleep? This sort of design could also deal with housing for the homeless. An inexpensive dwelling with security and privacy beats living in a shelter any day, and these could be set up or moved quickly as the needs change. I’m thinking that it warms up like an oven. In reply to Michael Patrick’s observation “I’m thinking that it warms up like an oven” Fuller’s designs for such structures used natural airconditioning where as the structure heats up, the rising thermals draw out air from the lower part of the structure which draws in the column of cool air in the centre of those thermals into the fixture at the top of the structure. While these do look fairly inexpensive, these days we have nice rectangular shipping containers that can be converted to shippable housing much more easily than 24′ culvert pipe can – and the interior space would be more efficiently used.